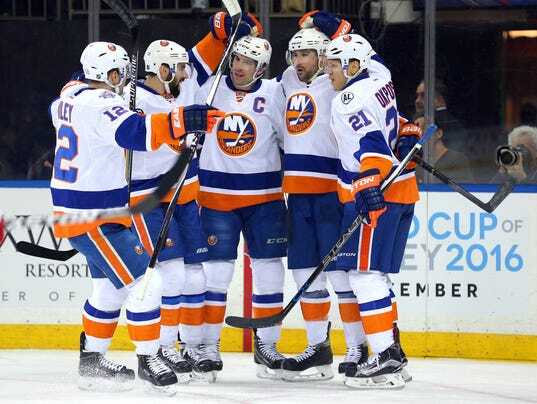 NEW YORK (AP) — Cal Clutterbuck’s late goal helped the New York Islanders cap a stellar road trip and edge closer to the Rangers in the playoff race. Clutterbuck scored the tiebreaking goal with 1:28 remaining in the third period, and the Islanders fended off the New York Rangers 6-4 on Sunday night. The Islanders, who led 3-0 and 4-2 before the Rangers rallied to tie it on Derick Brassard’s goal with about 8 1/2 minutes to go, ended their season-high seven-game road trip at 6-1-0. On the winning goal, Casey Cizikas won the faceoff against Derek Stepan and Clutterbuck wristed it past Antti Raanta from the top of the left faceoff circle for his 12th of the season.